Diane Pernet is one of most recognized icons of fashion industry, not only for her absolute black outfits, or her fantastic career, but because now she is one of the world’s most important bloggers and some kind of patron of young talents. Her blog “A Shaded View on Fashion” is the directory of new talents, coolest events, and people who do interesting things related with fashion. Her last project, ASVOFF (A Shaded View on Fashion Film) is a Film Festival where the common thread that binds diverse programs is fashion as main subject, theme or cinematic aesthetic. To know about her life, career and projects, nothing better than interviewing her, and she delighted us with each answer. Fabrizzio Morales-Angulo: Diane, you have been in many interesting places and participated in several notable events- how do your organize your schedule? How do you determine which events and places are the most interesting? 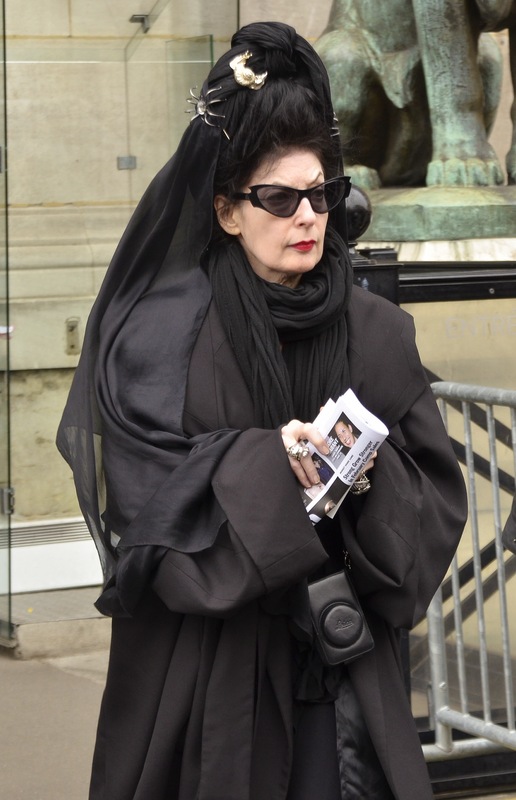 Diane Pernet: I guess it is basically by instinct. I also have great contributors that I send to events that I physically cannot attend and it is like a little perk for them to go. Let’s say if I’ve been several times to Sao Paulo I will send a contributor that really wants to go. I used to attend more fashion weeks but I’ve been concentrating on my ASVOFF fashion film festival and I cannot do everything so I make my selection based on instinct and if it is somewhere that I’ve never been and really would like to discover. FMA: Diane, your presence at events can give prestige to them; and can even warrant success. Your opinions are very important in the fashion industry. How important is it to you that your presence and blog can open doors for others? What level of responsibility do you feel about this type of influence? DP: Very important and really the reason behind setting up the blog. I wanted to give a platform to creative and emerging talents in all fields that I find interesting. Of course when an emerging talent becomes an established talent I am very happy for them and naturally as much that is interesting as possible. As for the responsibility, it gives me the greatest pleasure when I can support talent. I was a fashion designer myself for 13 years in New York with a license in Japan for 5 years and I know as an independent designer and not an advertiser …it is not always that easy to get the coverage in the press that they deserve. Blogs are good for that. Naturally I do not expect anything in return for my support but it is gratifying when people do not suffer from that disease of ‘fashion amnesia”. For instance it made me happy when my contributor Alex Murray Leslie interviewed Wisharawish Akarasantisook who won the 2012 Mango Award and in the interview he remembered that on my only trip to Bangkok I had singled out the collection that he had designed and thanked me for my support. He had submitted his work for the Festival d’Hyeres about 4 years ago and I was gutted when his portfolio was rejected. Great compensation with this very generous award. FMA: Your career path included costume designer, fashion designer, fashion editor and now blogger and designer’s friend. Which of these positions did or do you feel the most comfortable? Is there one that you enjoyed more? DP: Naturally when I was a fashion designer for my own brand for 13 years it was my heart and soul but honestly I feel the same with ASVOFF , my fashion film festival. I founded it and direct it and it is a way that I can join all the things that I love, fashion and film and giving a platform for emerging talent and…established talent. FMA: What do you think about the influence of the internet and technology on the fashion process? Do you feel that this internet immediacy translates to something being lost in the fashion process? DP: I think it is great because it pulls back the curtain and gives the consumer full range to make their own decisions rather than be at the mercy of the selection of buyers. It is good for the designers and for the consumers. I remember years ago when I spoke with Ennio Capasa after he had set up his own e commerce site and he told me what a huge boost that was to his business and how it was interesting to give the clients full opportunity to choose the designs they liked from the entire range of the collection. As far as something being lost, maybe the internet makes things too easy sometimes as far as research is concerned, it is hard to remember when people had to search through libraries to find very specific interests. Now the web makes everything available instantly to everyone but hey, that is our times and I welcome it. I do not see things in the same way as Tom Ford who feels it is better kept very exclusive. FMA: Okay, now something less serious: – Black for elegance; to look thinner, or because it is easier to choose your outfits? DP: Black because it makes me feel good and I find the colour has a power and it is always right – day, night, casual , formal. I do think black is the most elegant color, I know it is a mix of all colors and therefore a non color…. FMA: What do you think about this statement: “Black colour is a way to call attention, while passing unnoticed?” DP: I don’t believe one dresses in black to call attention to yourself. If you want that then dress in neon, bright colors, prints, red or white. Black is …shaded.